I have a love-hate relationship with shower hosting. I love, love, love throwing bashes for amazing people who have exciting things, like weddings and babies, to celebrate. I hate, hate, hate folding chairs and ordering cakes and not really knowing if I’m meeting even the lowest of expectations by the guest of honor (or the other guests, for that matter). This Saturday morning, waking up to my alarm meant hauling folding chairs to my car, picking up a cake, making an appetizer, etc. I braced myself for the day. I co-hosted a co-ed baby shower for friends who are expecting their Baby Viv in July. Honestly, though, it was one of my favorite showers ever. The three of us hosting aren’t super tight, but it has been fun to get to know them better. Plus, someone else cleaned their house (!!!) and we split the costs. Bonus! The Ws are smart cookies (an engineer and a PhD candidate) so we had a “nerdy baby” themed shower. Easy décor (ABCs, books, and cheapo glasses) and something a little different. We kept the time short (about 2 hours) realizing people might hang out a little longer as they were able. We had a chock-full-o-fun two hours, and people felt good about leaving when they needed to. Two great games kept everyone, including the guys, involved. The first was guys-only: a relay race involving balloons under shirts and quarters between knees. I won’t make the pictures public, but I promise they are epic. 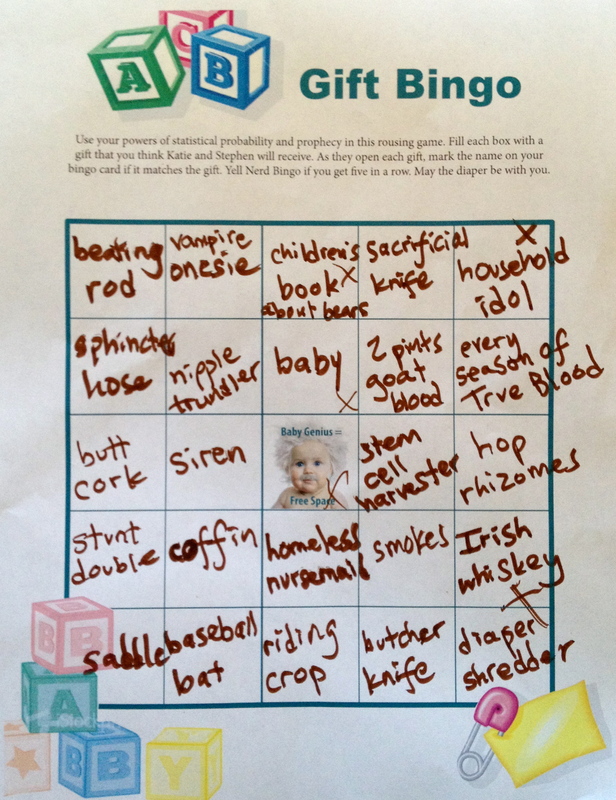 The second was just simple gift bingo to entertain during present opening, but several people really made it interesting. One example is below. Amazing–much too awesome not to share. I love my friends. I think we did really well, but one flop that comes to mind is that we never did introductions, and I know I was meeting new people, so I can only guess that others were, too. On a personal note, we had a little bit of babysitter complication, so I didn’t help with clean up much. Mea culpa. I was assured it wasn’t too burdensome. I really, really hate folding chairs. I just do. On our short drive home from the shower, Eric said, “That was actually fun. Good job.” So I’m going to go ahead and say that it was an awesome shower. Now I just can’t wait to meet Baby Viv!